Milk and honey can do wonders if consumed individually but when taken together, they provide surprising health benefits. The health benefits of honey and milk include advantages in skin care and an increase in stamina. Honey is traditionally used for health because of its antioxidant, antibacterial, and anti-fungal properties, as well as its soothing, and anti-inflammatory effects on respiratory issues. Milk, on the other hand, has traditionally been praised for its vitamin and mineral content, including vitamin A, B vitamins, and vitamin D, as well as calcium, animal protein, and lactic acid. However, these attributes can combine when milk and honey are taken together, resulting in some unique and desirable benefits. Both honey and milk possess antimicrobial and cleansing properties. Use of honey mask is effective for relieving acne. These properties are enhanced when the two are taken together. Numerous cleansers are prepared using milk and honey because the mixture gives the skin a healthy glow. One can also enjoy a milk and honey bath, by mixing them in equal quantities in water. The combination is often used in popular spas throughout the world. Honey is a good source of prebiotics, according to a study published in the Journal of Agricultural and Food Chemistry. Prebiotics are nutrients that stimulate the growth and development of probiotics, the beneficial bacteria growing and developing in our intestines and digestive system. Prebiotics has demonstrated a stimulatory effect on bifidobacteria, a type of probiotic found in milk. The carbohydrates and oligosaccharides in honey promote a healthy and proper function of these beneficial bacteria that are essential for the healthy maintenance and function of the GI tract. When the bacterial balance in the digestive tract is good, it eliminates a number of irritating conditions including constipation, cramps, and bloating, and it prevents the development of detrimental bacterial growth. A glass of milk and honey every morning is known to improve a person’s stamina. While milk contains protein, honey contains the necessary carbohydrates required for an effective stimulus of the metabolism. Milk and honey together provide strength to everyone including children and the elderly. As research on honey continues, it is gradually becoming clear that honey acts as a carrier and transporter of nutrients from food throughout the body. Specifically, honey has shown itself to be integral in the body’s uptake of calcium, of which milk is a rich source. This is confirmed by a study performed on rats by Dr. Merlin Ariefdjohan, University of Colorado, US. 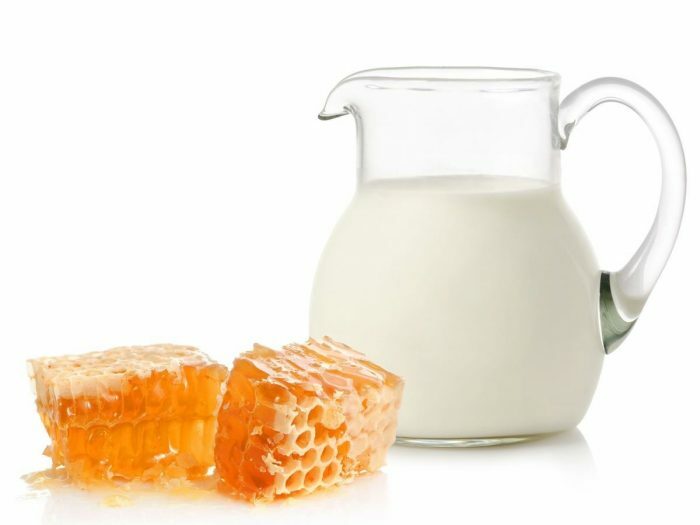 Therefore, consuming honey and milk together will not only give your body the necessary nutrient (calcium) to benefit your bone health but will also maximize its absorption in the body. Proper calcium levels can prevent conditions like osteoporosis and inflammation of the joints. Tryptophan is normally converted into serotonin, which induces a feeling of relaxation. Furthermore, serotonin is commonly converted to melatonin, a well-researched sleep aid. A negative impact of tryptophan depletion on sleep continuity is well demonstrated in a study published in Psychiatry Research journal. Thus, honey and milk can be used to reduce sleeplessness. The antioxidant properties that occur when milk and honey are combined are great because antioxidants attack the free radicals which are one of the primary causes of skin degradation, wrinkles, and blotches. Dr. Brendan Niemira, research leader at the USDA Research Center confirms the antioxidant property of honey in one of his studies. Research has shown that milk and honey have a more pronounced effect on Staphylococcus bacteria than milk or honey when taken alone. It is also believed that honey, added to warm milk, cures flatulence, constipation, and intestinal disorders. It is also good for treating respiratory disorders such as cold and cough. Does Honey Become Toxic In Warm Milk? Honey does not become toxic when added to warm milk. However, honey should not be heated to temperatures higher than 140 degrees, according to a study published in the Ayurveda journal Ayu (A. Annapoorani et al., 2010). According to the researchers, the honey, when heated, produces a toxin called hydroxymethyl furfuraldehyde (HMF). It is recommended to add the desired amount of honey in warm milk, rather than hot milk, to get the full health benefits of this combination. So enjoy your cup of honey and milk! Jerusalem is referred to as ‘the land of milk and honey’ in an old testament. The benefits of honey and milk on the human body are so enormous that the phrase “land of milk and honey,” meaning “a place which has plenty” is rightly used. Average rating 3.9 out of 5.0 based on 2321 user(s).